Epoxies are created through reacting a hardener and an epoxy resin or by reacting the resins with themselves. Epoxy resins are a vast class of prepolymers and polymers containing more than one epoxy group, also often referred to as glycidyl or oxirane groups. The majority of epoxy resins are an industrial product derived from petroleum and are themselves the result of a reactive process involving epoxide units (cyclic ethers with three ring atoms). Depending on the type of reaction used to produce them, cured epoxy resins can have variable chain lengths and purity grades, corresponding to various molecular weights. They can be either low-molecular honey-like liquids or high-molecular, solid substances. Their molecular weight often determines their potential uses and applications. Epoxy resins are quite stable at room temperature and gain their ultimate performance characteristics only when reacting with curing agents like e.g. polyamines, aminoamides and phenolic compounds. The most common epoxy resins are based on reacting epichlorohydrin with Bisphenol A. This reaction transforms the basic building blocks into a different chemical substance called Bisphenol A diglycidyl ether, which is a low-molecular resin more commonly known as BADGE or DGEBA. It represents the smallest type of epoxy resin. Currently, BADGE-based resins are the most widely commercialised resins of this kind. Amines: Most widely used. They react at room temperature or a little higher. Anhydrides: They are used at elevated temperatures. Very low viscosity and long “open time”. They can be used with mineral fillers, e.g. for high voltage electrical insulators. Phenols: They react at elevated temperatures (130-180°C), usually needs a catalyst. Epoxies can react with their own phenolic groups. Used for powder coatings. Thiols: They are very reactive, even at lower temperature. Perfect for domestic DIY adhesives and chemical rock bolt anchors where no heating is possible. Thiols have a pungent odour. For more information about how to handle epoxy resins in safety visit Worker Safety. Epoxy resins are measured according to their epoxide content, also known as epoxide number. This represents the number of epoxide equivalents found in 1kg of resin or the equivalent weight, which is the weight of resin containing 1 mole equivalent of epoxide. The state of the resin will change depending on its epoxide number. Low molecular epoxy resins with a molecular weight of 380 will be fluid at room temperature, while resins with a molecular weight of 1000 and beyond will be solid. This number is also indicative to calculate the amount of hardener to use when curing the resin. 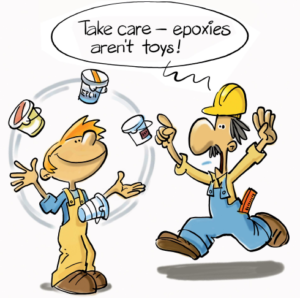 Low molecular epoxies can be handled without solvents and are used for castings, thick coatings, gap-filling glues, etc. High molecular epoxy resins can be dissolved in organic solvents to become manageable and are mostly used for paints and lacquers. In their solid form they are often employed as powder coatings.